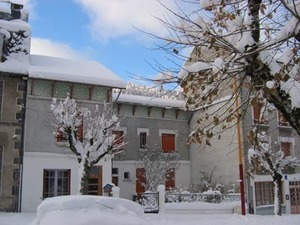 Les Amiraux is a small, friendly and comfortable b&b with a terrace in the spa and winter and summer sports resort of Le Mont Dore. 4 ensuite bedrooms (with TV, hairdryer and kettle) offer good value accommodation in an area of outstanding natural beauty in the parc des volcans, with plenty of activities available locally. We offer complimentary hot and cold drinks - juice, beer, wine - on a help yourself basis throughout the day and evening. The stop for the free ski bus is c60m. Described in the Rough Guide as "an altogether wholesome and civilized sort of place" Le Mont Dore is a spa town and a centre for winter and summer sports. We're only 4-5 minutes walk from the centre of Le Mont Dore where there are plenty of good value cafes and restaurants plus a range of activities including a riding stables, summer luge, ice rink and indoor bowling. There are loads of other outdoor activities including walking, cycling and accrobranche (an adventure park in the forest). We can help arrange guiding, equipment hire etc. All our rooms are ensuite and there is a terrace and a lounge where you can relax. The nightly B&B room rate is 64 euros based on 2 adults sharing. (46 euros sole occupancy.) Reduced rate for children. We do not increase our rates during the school holidays. Just 20 minutes from Junction 25 of the A89. By train there is a regular service from Clermont Ferrand to Le Mont Dore.